(Newser) – The prime minister of protest-torn Ukraine has submitted his resignation, saying he hopes the move would help bring peaceful resolution to the crisis that has gripped the country for two months. 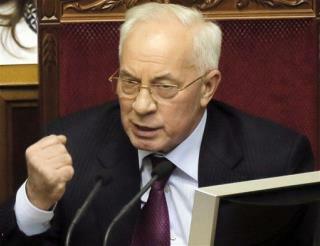 Mykola Azarov's resignation would remove one of the figures most despised by the opposition. Hours later, parliament repealed harsh anti-protest laws that set off the police-protester clashes in which at least three protesters died. "We have repealed all the laws against which the whole country rose up," says top opposition figure Arseniy Yatsenyuk. It certainly seems that people can make a difference. If you just gun them all down you have no constituency. People have to believe in order to put their bodies on the line. It's kinda pathetic to operate with cold war tactics in the information age. We know exactly where their funding and training is coming from. This will back fire in a major way. Ukraine is a powder keg and the west is lighting with the fuse. Blood of slavs is already been spilled and this will not be another Yugoslavia. School boy in the White House better stop pouting before things spin out of control. More people should have voted for Yulia Tymoshenko, the blond princess Leia. Instead they just threw her in prison (well, currently in hospital).